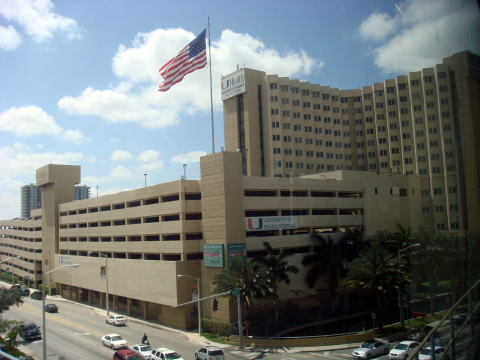 Miami-Dade Transit is the largest transit system in Florida. The current standard fare on Metrorail is $2.00. Card system until late 2009. The system replaces the old cash-/token-based system. 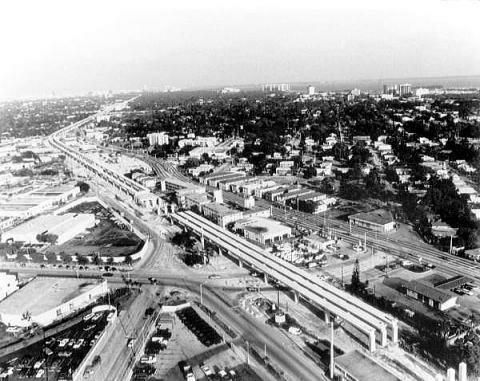 (L) Metrorail viaduct under construction during the early 1980s. 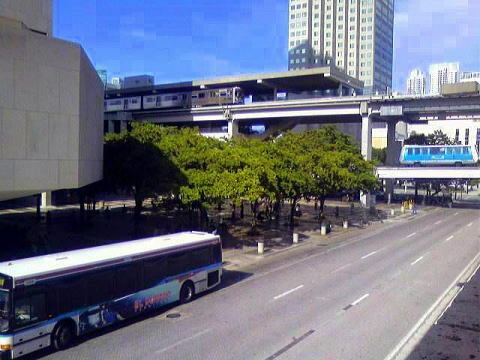 (R) Government Center Station, the main station in the downtown Miami.Transfers can be made to the Metromover and to the Metrobus. 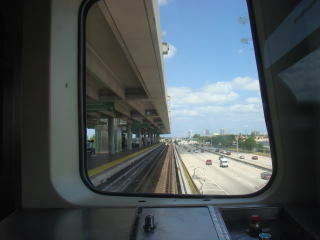 I know the first time on this trip that there is an elevated railway system in the suburbs and the city center of Miami. 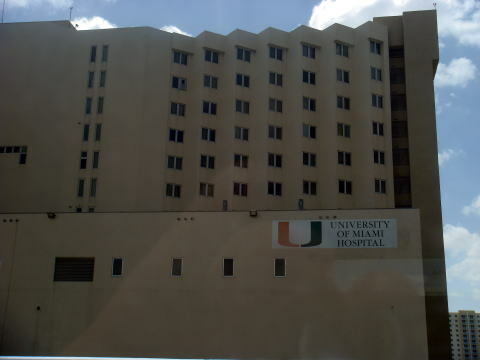 It is worth riding a train, since it is easily learned from the train window the geography of Miami districts. The construction of Metrorail viaduct started in 1979 and was completed in 1984.
we do not need to worry much, and we can see a construction of many condominiums and an individual private house. 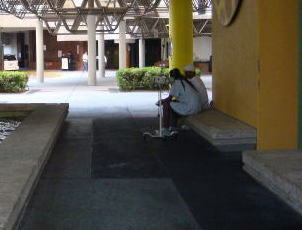 This appears to be a natural flow that aged people after retirement at this area because of a warm climate. 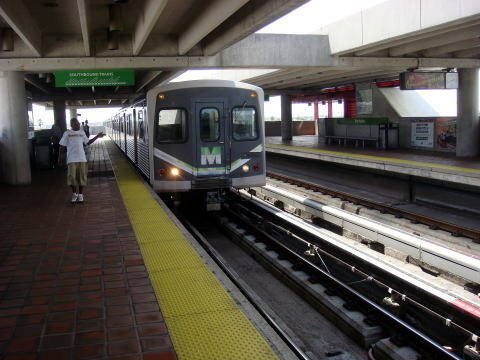 (L) A Miami Metro train is arriving at the Northside station. (R) A Metro train is approaching to the Earlington Heights station. 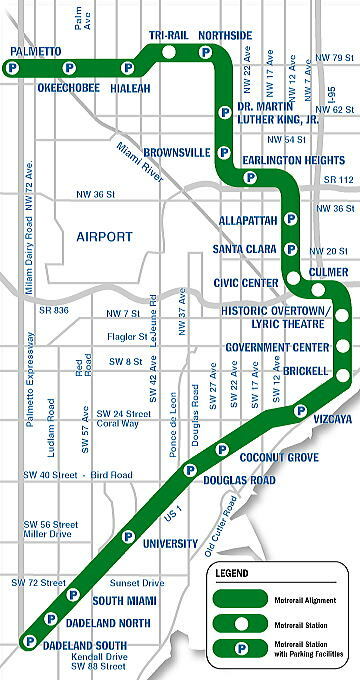 (L) A route map of Miami-Dade Transit. 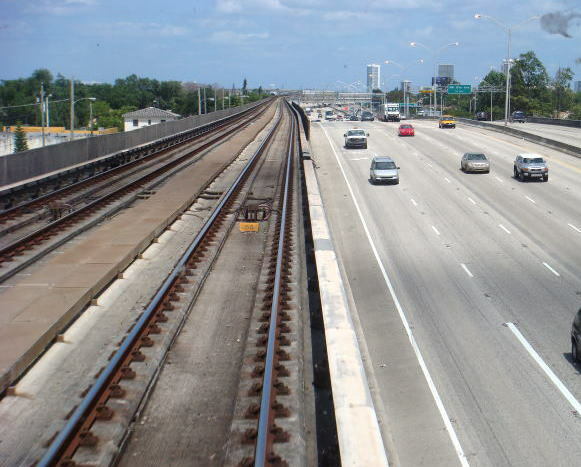 (R) A Miami Metro runs along Airport Expressway, near the Miami International Airport. To ride a train, we have to insert three 50-cent coin at the ticket gate. The exchange machine is set at each station. However, it is often broken and person looked like station attendant collected a coin. There is no ticket at any form. air pollution, the city recommends so-called 'Park and Ride' scheme. A parking lot next to the station is free of charge. 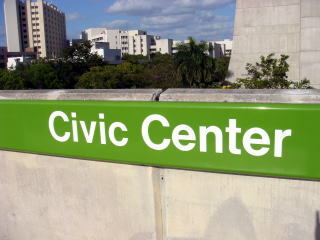 (L) Civic Center station of Miami Metro is the place to take off a train to visit the Medical Center. 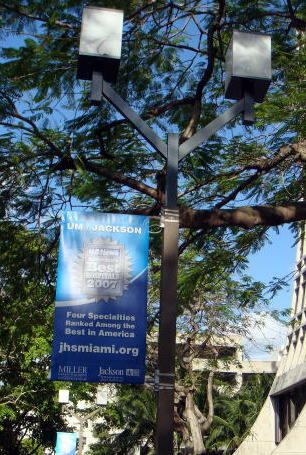 (R) A hanging screen which shows that the University of Miami Medical Center was loaded with honors as the first in the 4 medical specialities in the United States. 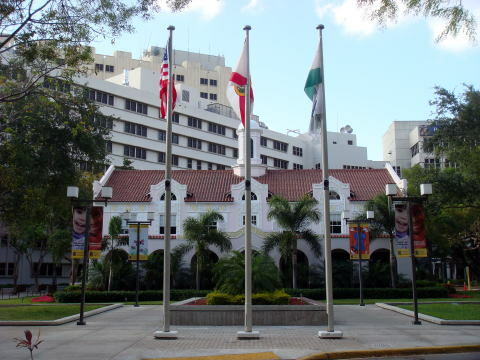 (L) Alamo Historic Site of the University of Miami Medical Center. 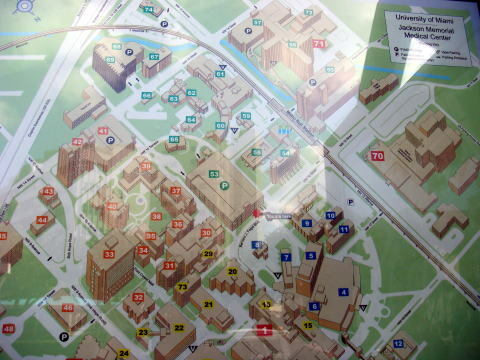 (R) A campus map of the Medical Center, Miami, Florida. 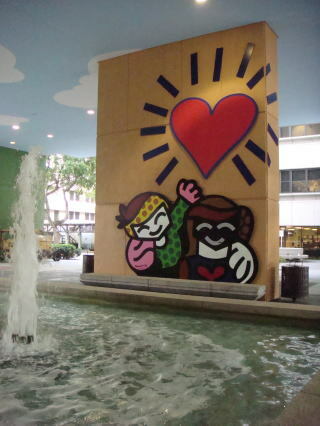 (L)(M) The entrance of Children's Hospital and a court yard fountain. 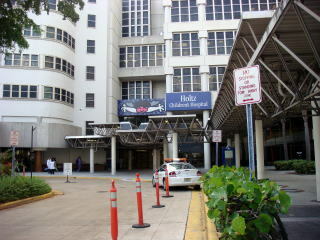 (R) An inpatient with an intravenous drip came out to put the light on cigarette. 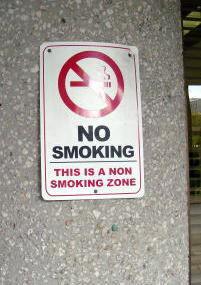 (L) No smoking sign plate at the entrance to the hospital. 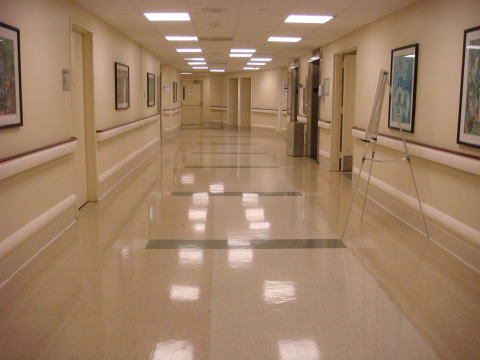 (R) A very clean, neat hospital passage, University of Miami Medical Center. 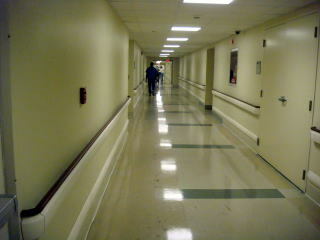 (L) A corridor of hospital ward. 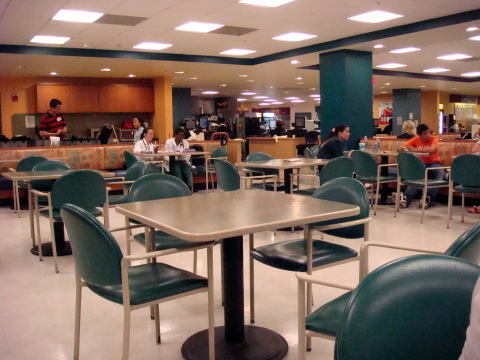 (R) A cafeteria in the Medical Center. A lunchbox of Sushi is available here.